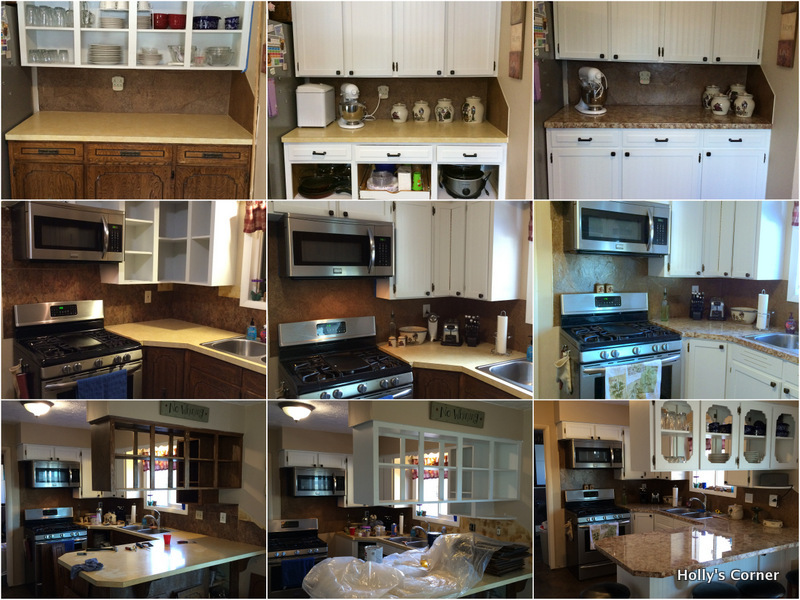 It’s been on the “to do” list for a long, L O N G, time: Give this old kitchen a facelift! That 70s scroll has been updated to a new, bright, trimmed, bead board finish. And I couldn’t be happier. Filling in the scroll detail and hardware holes. Gluing bead board wallpaper over top. This is a resurfacing kitchen cabinets project. 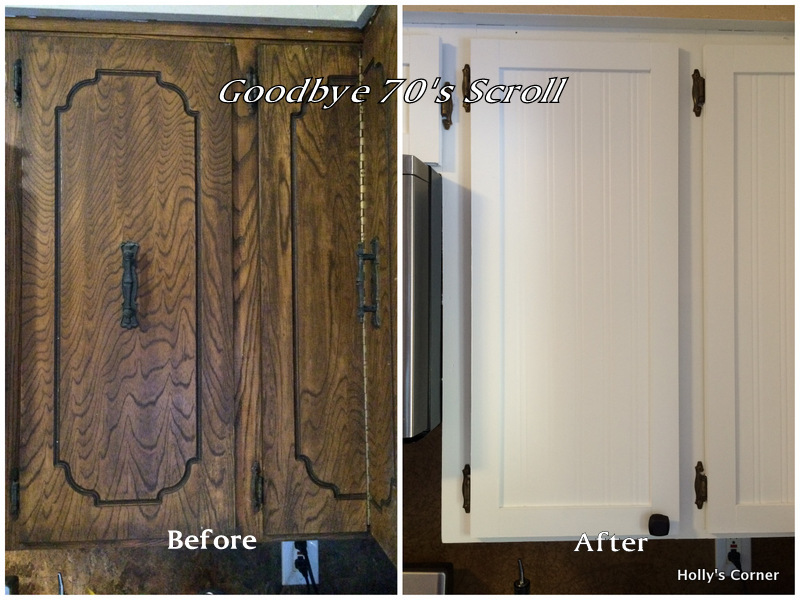 I used bead board wallpaper and vinyl trim to give the old doors a new look. 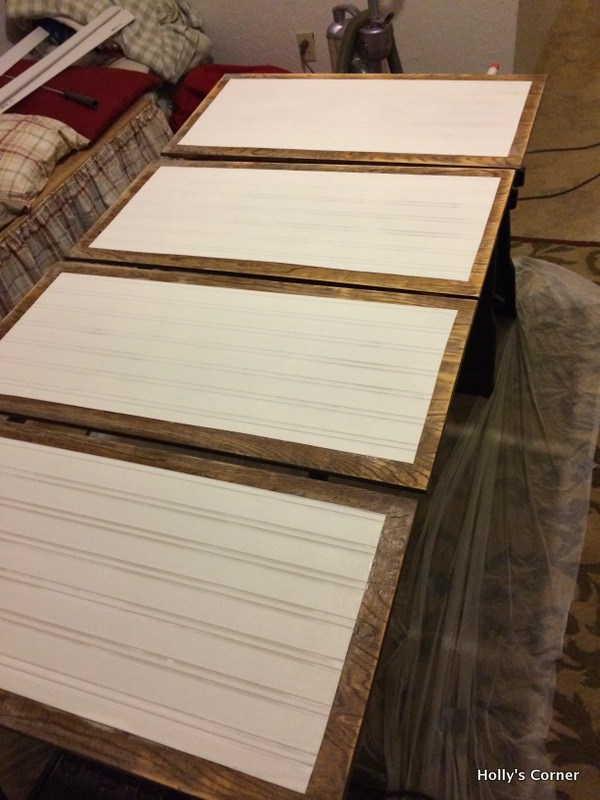 The process is a matter of preparing the old doors for refinishing, adding new materials to the front of the cabinets and painting. Preparation includes removing hardware, cleaning, filling any scroll work or old hardware holes, and sanding. 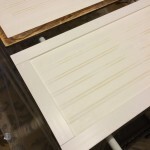 Applying new materials will require the trim and wallpaper as well as the tools to fit and glue them onto the cabinet face. Painting is a two step process of priming (oil based will both seal and maximize adhesion of paint) and painting. 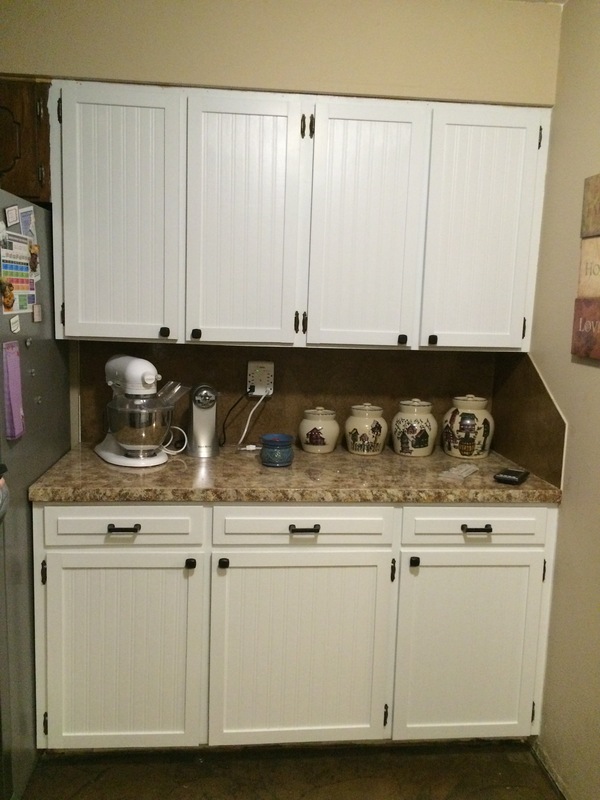 Working with old cabinets brings unique challenges, and in my opinion working with what you have is a must for this kind of project. Narrow doors like mine mean cutting corners, like using wider trim to hide old scroll work, could result in unsatisfactory results. These things will impact what you choose to do and what it takes to get it done right. Other considerations include mixing new and old materials and how they’ll look when finished. I opted to find a way to reface all the front surface so the paint would be uniform over new materials, a GREAT call. 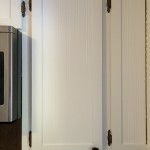 Further, adding thickness or weight to doors can cause problems – hence the wallpaper bead board and light vinyl trim. Taking time to really consider the existing custom work of your kitchen will help form a style option that works for you and your existing cabinets. This is critical for super custom sections like corner cabinets, etc. I do as much online as possible. I love having things shipped to me, and living in a rural area can limit your choices. So I always start my searches for materials on Amazon and reserve the hardware and home improvement stores for a few items that just need done locally. I asked local paint specialists for suggestions and tips and took the time to look around the home improvement store for trim options that resulted in finding the perfect solution for me. 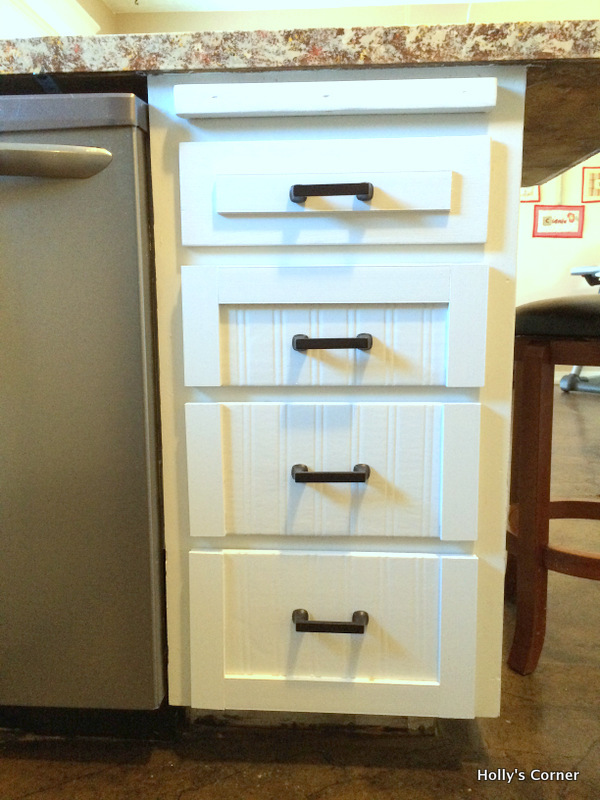 Keep in mind that some things you may have to reuse (like original hinges to make things fit right). DIY doesn’t mean free. Avoid the intersection of cheap and easy. Be realistic, if it was going to cost you $5,000.00 to replace cabinets, then spending $500.00 isn’t going to be unreasonable for a DIY resurface. Remember, little items add up. Like new handles and pulls – $3 – $4 ea adds up when you realize you need on the order of 36 and that’s $100-150 by itself. Paint will run you anywhere from $30-60 a gallon. So before you even start looking at things like wallpaper and trim you’re already easily at the $200 mark. Plan on investing a reasonable amount of time and money into a project like this. Don’t rush it. Paint can only dry so fast and haste makes waste. I kept a container of Lysol disinfectant wipes handy…they are perfect for cleaning quick painting messes and wiping off glue. I spent a great deal of time researching options, paint, etc. There’s so much out there! Here’s how I decided on things and my considerations. I started by asking a paint specialist for recommendations and suggestions for painting my 70’s, dark stain, cabinets white. His suggestions were invaluable. He suggest proper preparation of cleaning and sanding, sealing with an oils based primer as woods will leak sap and oils, and finishing with a high quality latex paint. He also told me pure white paints don’t cover as well (even showed me the manufacturer’s note of exclusion on this) so advised me to pick out a white tint I liked. Sure wish I’d known this before I used a plain white base paint to do all my ceilings and trim a few years ago! This piece of advice was absolutely true. I knew I couldn’t tackle this project at one time. It was just too big and I have an 8 month old now. This has definitely been a broken down task but it’s worked out well. I’ve had time to learn what works and what doesn’t, how to do things right and not rush. Here’s a sneak peak at what I mean when I say broken down. I mean really broken down like top section, bottom, repeat in another area kind of broken down. The best advice I have to offer on this is simply to give yourself permission to do things as you can; don’t let time expectations stunt your productivity. Any progress is still progress, even if it’s not all at once. 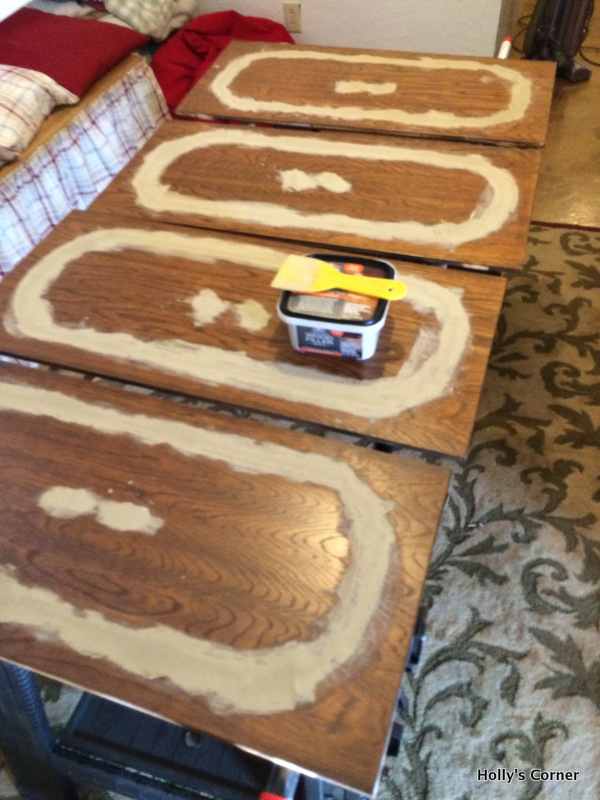 You can’t rush things like paint drying time, so I figured I’d embrace it and shuffle between tasks as time allowed. I’d also advise anyone ready to tackle this project to be ready for a few surprises. My first one included seeing how the cabinet had pulled away from the ceiling from years of weighted content. The middle section had actually bowed by nearly 1/2 inch. If you’re equally unfortunate, you’ll be happy to know a few cabinet screws can restore and lift everything back to it’s proper placement. Your doors will hang right and thank you! Speaking of hanging right, I also learned that even buying the same style of hinges didn’t work. They are ever so slightly different in measurements than the originals and the doors wouldn’t hang right. So I ended up reusing the original hinges and buying new hardware to match. Prep work included scraping off all the old toad stool contact paper used as shelf liner, light sanding around the front of the wood, priming and painting. By the way, I wouldn’t be without one of these scrapers for most any project, but I used it several times during this one! I know a lot of people don’t worry about painting the inside of their cabinets, but I’d have been super unhappy if I’d left them. Especially with white fronts. Besides, now I know everything is clean! I only used brushes, one for the primer and one for the latex. They are the only two brushes I used for everything. Both were recommended by the paint specialist and I’m glad I followed his advice, including storing the cleaned brushes back in their original containers to maintain their shape. These are worth the investment and truly the only tools I used to paint everything. I got one in each brand to ease in keeping them separate, but found both equal in quality. I used a Kilz oil based primer recommended by the paint specialist. I can tell you, this is a little like glue when applying and I can see why it’s recommended for this purpose. 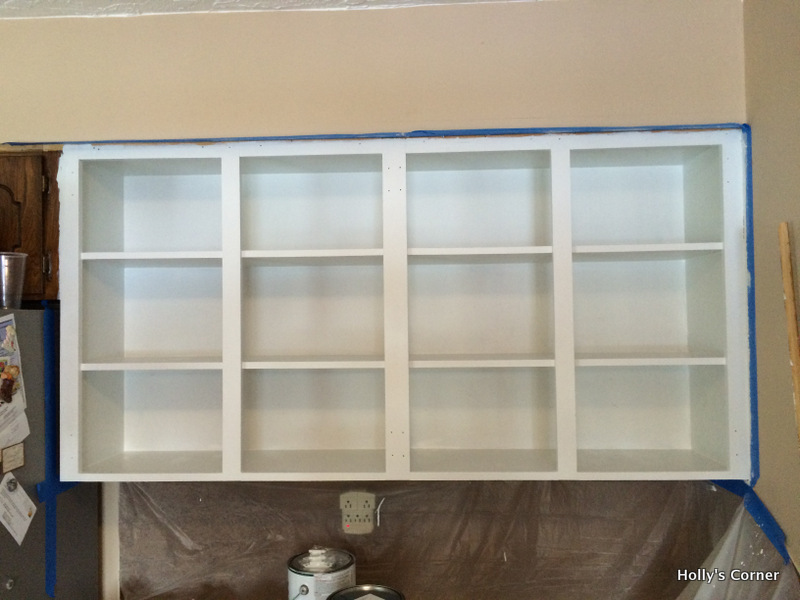 It made the next coat of latex paint a one step process. Don’t skip the primer! Total pain, but using a base of oil based primer is key to success. 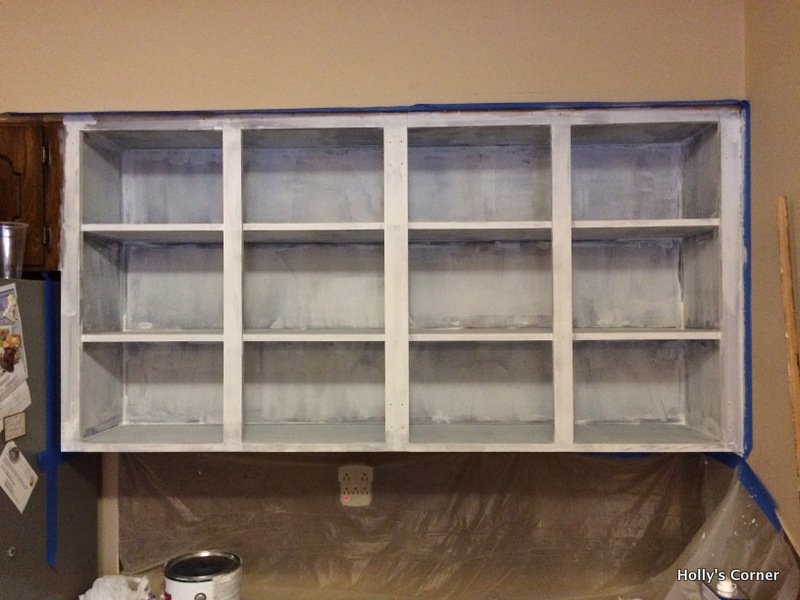 First (and only) needed coat of white latex paint over the primed surface. I chose a white tint I liked and purchased a gallon of satin Valspar from my local Ace Hardware store. I shuffled between painting the inside cabinets and working on the doors, making use of drying time to alternate between the two. The first step with the doors was removing all the hardware. 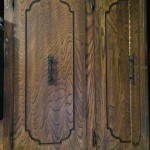 Then I filled all the decorative scroll and old hardware holes in the middle of the doors. 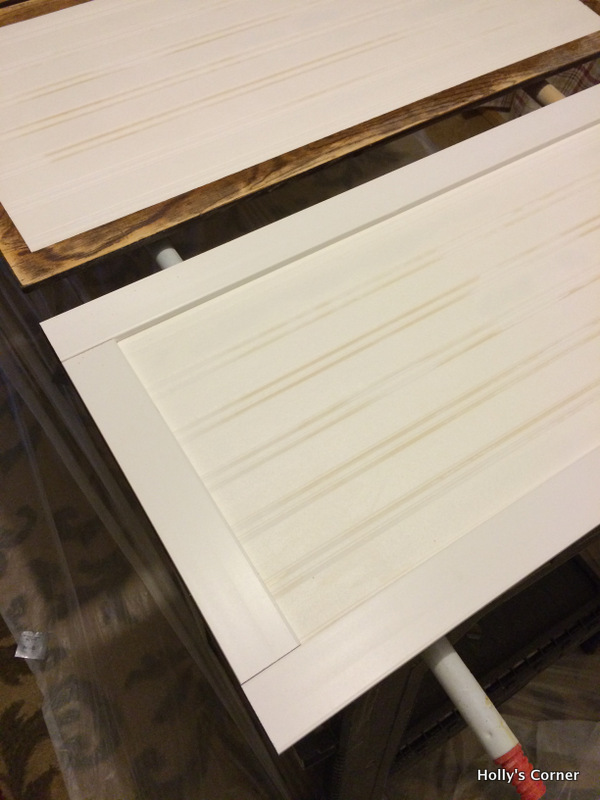 After drying, I sanded the surface of the doors – front, back and sides. 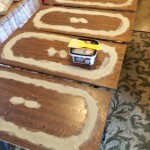 An electric sander works great and takes only minutes. My advice is definitely do this outdoors as the dust is a mess, protective masks are also a good idea. Then it was on to gluing the wall paper on the fronts. I didn’t worry about exact measurements because I knew I was putting 1 1/2 inch trim around the edges. Although this paper is pre-pasted, I used an all purpose adheasive and only sprayed enough water on the paper to activate the glue. I used one of the large plastic spatulas to smooth the paper down and remove air bubbles. Next came adding the trim. I didn’t use a measuring tape (gasp! I know). I’ve found over time, that few things in a home line up, are at perfect angles or fit on a square. So, I placed the trim over the length of the door, marked it and cut that length. Then I checked it to make sure it fit the length of the door and used it to mark the second one for the other side. Then I’d lay those two pieces in place and mark the inside sections. 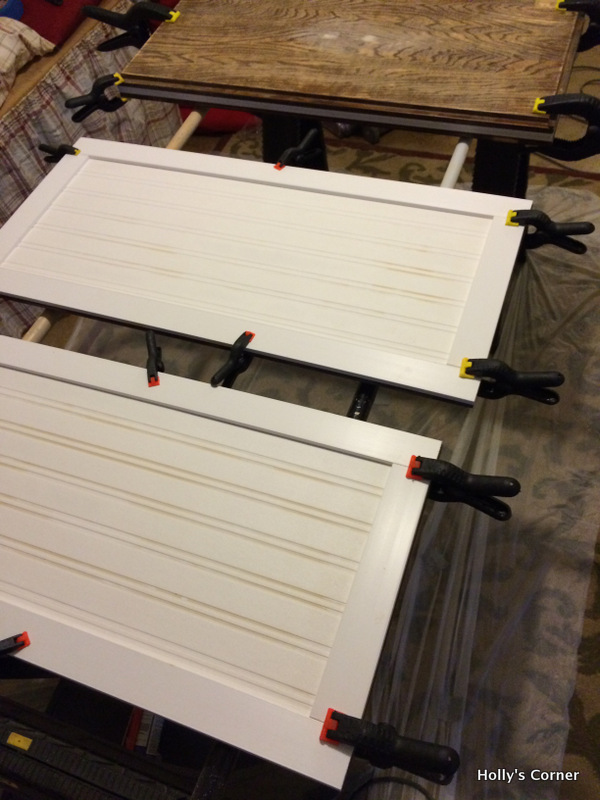 Then I glued the pieces in place and clamped them for security and accuracy during drying. I found the key in the process was making sure edges lined satisfactorily and to recheck all the areas after clamping and the slightest shift can happen during this process and result in a piece drying just off where you wanted. When the trim was dry I sealed any gaps along the edges with caulk. Gluing trim on the cabinet edges. I painted the back of the doors with the primer and one coat of the latex paint. The fronts got two coats of the latex paint. Painting over the new cabinet surface. One final note on working with custom bases… I had to figure out how to work the custom design on a corner cabinet and some drawers. Originally, the scroll on these drawers were done to make it look like the bottom three drawers were one design. I went back and forth on trying to decide if I should frame in all the sides or follow the custom design of connecting the bottom three. In the end I went that route and I think it was the right call. Working as much as possible with the original can pay off. Fantastic facelifts from 70’s scroll cabinets. And now I have a kitchen that has gone from dated 70’s scroll to sleek and bright white. I know, I know, how could I part with that old stove? Sorry, some things just deserve retirement. A little paint, trim and wallpaper go a long way! For more DIY ideas, check out my post about Brown Paper Floors. Can you tell me know these have held up? Covering with “paper” makes me a bit nervous that all this work will wear off fairly quickly… how do you clean these? would you do it again? Thanks! Yes, I’d do it again. 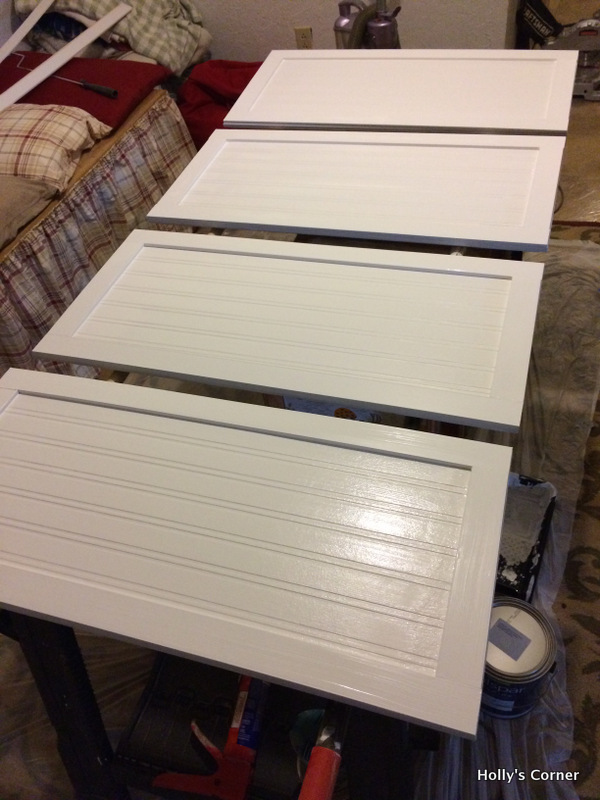 The paint finish cleans with a rag or Clorox wipe as easily as the painted wood, the white shows more and in the past two years, my bottom doors by my sink have needed fairly regular cleaning. They’ve held up great. The only thing I’ve not loved is the soft, foam element of the wallpaper. Even with the paint covering, it is susceptible to impressions and dings. 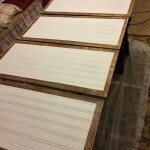 I had purchased some spray on polyurethane coating with the intent of covering the bottom of the island where feet kick all the time, but I never got it on so I don’t know if it would have done the trick.